Boston Restaurant Talk reports that Grass Fed on Centre Street will be shutting down, with its owner hoping to transfer its current alcohol license to the owner of the burgeoning Chilacates chain. No word on what sort of food the new place will serve; Chilacates already has an outlet on Centre Street, across from JP Licks. Boston Police report officers on patrol early this morning collared a guy they say they'd spotted trying to break into Marino's Market & Deli, 1906 Centre St. Read more. A fan of Cafe Beirut on Centre Street has set up a GoFundMe page to help owner Brian O'Muimhneacháin make up the $6,000 an employee managed to skim: Read more. 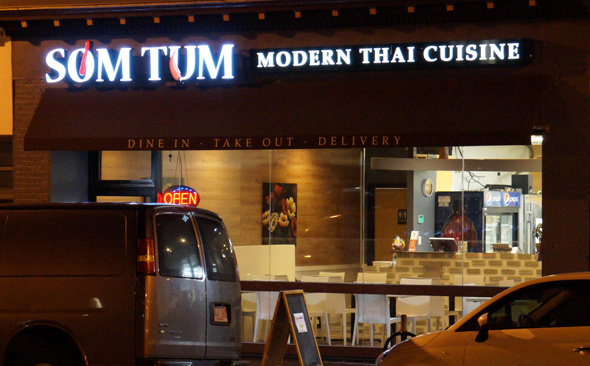 The Thai restaurant at 1894 Centre St. in West Roxbury has new owners, a new name, a new menu and new decor: Sticky Rice has turned into Som Tum Modern Thai Cuisine. Sue O'Connell of NECN had just gotten out of her car on Centre Street around 3:20 p.m. when a guy pulled out a gun and fired several shots. She reports there was a school bus full of kids right there. Read more. State Rep. Ed Coppinger reports that Local 338 - named for the union that represented New York bagel makers - opened for business this morning. It's sort of a hybrid place: The bagels are made in New York, frozen, then trucked to West Roxbury. Architect's rendering of 250 Centre St. The Board of Appeal this week approved plans for a 112-unit apartment building at 250 Centre St., which will fill in yet another hole in the streetscape left over from the I-95 extension that never was. Read more. The bagel hole in West Roxbury left by the closing of Panera in 2015 is getting closer to being filled, with "Coming Soon" signs sprouting at 1727 Centre St. for Local 338, which promises "New York style bagels" and organic gourmet coffee in the spot that was briefly a pizza/froyo place that replaced the Upper Crust that used to be there. Read more. Around 2:05 p.m. on Centre Street, in front of the Starbucks and Paper Store. 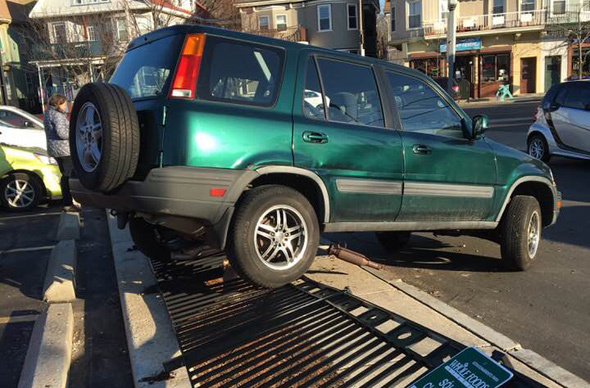 The driver got out OK.
Boston Police report arresting three men caught in the middle of a drug transaction at the Speedway gas station, 1779 Centre St., around 4:15 p.m. on Saturday. Read more. No injuries, but several businesses along Centre Street near the Bank of America parking lot lost power when the manhole lost its top, Ted Cooper reports. In a neighborhood where even banks are replaced by coffeehouses, an entrepreneur hopes to open another place to caffeinate. Read more. Wicked Local West Roxbury reports on plans for a bagel place in the same Centre Street block as Porter Cafe for a bagelry that would truck bagels "90%" prepared in New York, then cooked locally. The as yet unnamed bagel place would join Bruegger's Bagels and Bagelville on VFW Parkway. Exodus Bagels is now churning out bagels just off Belgrade Avenue on the Roslindale line, where it plans a full-scale deli, and, of course, the Dunkin' Donuts on Spring Street and VFW Parkway sell bagel-like round breadstuffs. The FBI announced today it's offering up to $5,000 for information that leads to the capture of a man who's been robbing banks in Massachusetts and New Hampshire while accompanied by his moll. Read more. Shortly after 10 p.m. on Centre Street near Lamartine, Abby Burns reports. Earlier in the afternoon, somebody was robbed at gunpoint on Centre in front of the Stop & Shop. Around 3:50 p.m., a bunch of teens held somebody up at gunpoint outside 315 Centre St., in front of the Stop & Shop. Suspects are at least three teens, one white, short and overweight, the other two black. The teen with the gun was black, with braids and wearing a black jacket and a black hoodie. Boston Restaurant Talk reports that Chilicates on Amory Street is planning to open a second outlet in the Centre Street space where Pink Samurai briefly opened for a few days earlier this year.